Ryan Lampers might just be the best public land mule deer hunter on the mountain these days though you would never hear him even remotely say so himself. Ryan is as consistent as they come and just happens to “get lucky” on every hunt. Ryan’s luck comes in the form of a perfect combination of hard work and persistence. In this episode, I try to crack into what makes Ryan so successful hunt after hunt and year after year. With three bomber bucks already in the freezer, this year and one more tag to fill Lampers has the skills to get it done from early season through late. One of the things I have picked up from Ryan is that he can read the lay of map better than most and just knows where to find those big bucks that nobody has messed with. This episode is brought to you by On X maps. On X is such an awesome tool and 100% a must have. There are so many great features on the onX maps app. First off the OnX Maps works without service. Let me say that again you do not need service to have badass maps right on your phone and the GPS works with no service or in airplane mode. I think so many people are confused by that. Its magic folks it just works. One of the cool ways I have been using my OnX maps this season is that every time I come across a heavy elk trail or cattle trail, I turn on my “Tracker” which basically tracks wherever I go. Then I just follow that trail on my way out and hit save. this records various trails all over the mountain that I can have for later. Now, say next year I get into a screaming bull on that same hillside I can look at my onX and see hey there’s a trail that runs right across this face over to him. It seems like every year I would think to myself, “I know there is a trail around here somewhere” now I have all of that info saved to my phone. Use the TRO promo code when you sign up or even just renew your account and get 20% off. www.onXmaps.com or at your favorite app store. Hey guys and gals, this is your final warning. I don’t want to hear any whining or complaining that you missed this when it is gone. This is your final opportunity to get try out goHUNT.com Insider for free. The free trial almost over, so if you want to see what everyone is raving about go check it out right now. GoHunt is by far and away one of my favorite tools and a must have in my opinion. I use goHunt religiously year around. From researching units to how to articles to grabbing last minute gear in the gear shop you need to be an Insider member. Do me a favor while the free trial is going on, which is not very long, head over sign up and check out the filtering 2.0 for 5 minutes. 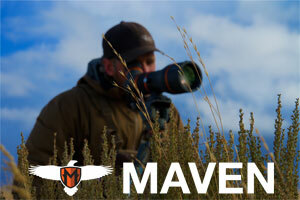 there are a ton of features to help you find better units and have more successful hunts. Head over to www.goHunt.com/tro to get your free trial. This year I launched Backcountry Fuel Box, a monthly subscription box for backcountry meals, bars, snacks, gues, and all kinds of great new products you have probably never heard of. It is a killer way to test out new options, or just save money by stashing each box for season. 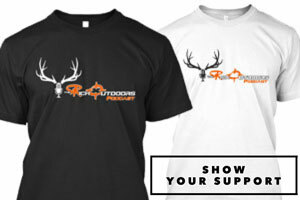 Check it out at backcountryfuelbox.com and save 10% with code TRO. Today’s podcast brought to you by Solo Targets. Solo Targets are life-sized ultra-realistic 2D targets. I have been using the solo targets all season and love the realism of having to pick a spot on an animal and not just shoot a spot. With Solo Targets, you can turn any block target into a realistic hunting scenario for far cheaper than a 3D target. Honestly, I like the realism of the 2D targets overshooting a 3d Target. I also really like that all of the targets are actual life size target which really gives you a feel for looking at that animal at different yardages. Solo Targets offers a realistic target in everything from predators to bighorn sheep and my favorite real-life size elk. These targets are incredibly durable and have lasted me all season. these targets are made of a waterproof material so indoors or out you can shoot all year long. head over to solotargets.com and use The Rich Outdoors code TRO to save 20% off your badass target system. This code won’t last long so if you want to give it a try order one now. This podcast is brought to you by GoWild. GoWild is the hottest new app for hunting, fishing, and the outdoors. Really love what those guys are doing over there and they just have so much going on, they are growing so fast, really cool to see. One of the really cool features about GoWild is that you can log time for being in the outdoors and doing outdoor activities. Whether you are shooting your bow, checking trail cameras, or sitting in the stand, log your time on your GoWild account and earn points. In fact, you can Log time listening to the podcast. Over just the last couple months you guys have logged 68,914 minutes of listening to The Rich Outdoors. That is insane! This month GoWild is doing a special giving-away for logging time listening to The Rich Outdoors. They are giving away a brand new fully set up bow. The bow is an Obsession Turmoil RZ which was selected as the 2017 Field & Stream Gear of the year for mid-priced bow. This thing is completely set up with trophy taker products all you need is a D loop put on. 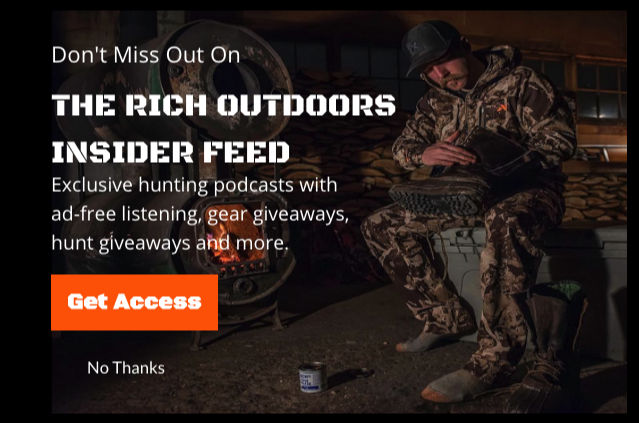 In order to be entered to win the Obsession Bow all you need to do is log time listening to The Rich Outdoors on the GoWilld app. if you are already a GoWild user just go where you would normally make a post, hit the plus sign and hit Log. It is really easy and if you aren’t a GoWilduser you better download the app ASAP and log some time listening to the podcast so you can win a brand new Obsession bow. I have been getting pounded with questions since elk season and I think specifically since my elk hunting podcast in Montana. As a way to answer your questions to as many people I put out a call for questions and am sitting down to knocking out a few on the podcast. I didn’t get to all of the questions but in this podcast, I cover a bulk of the questions surrounding Elk hunting, gear, mindset, and entrepreneur questions. I’m not a huge fan of talking so much on the podcast, (I prefer other people talk) but if you liked this or if you have more questions, by all means, let me know. Do you like tracking animals? This episode of Wapiti Wednesday is fully dedicated to tracking big bulls in the snow. 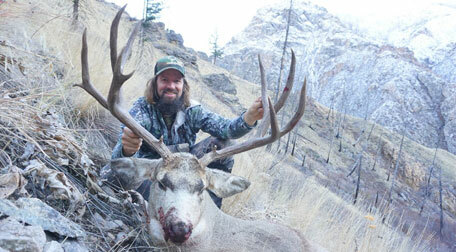 Todd Orr, who is notoriously known for surviving his double grizzly bear is actually an amazing elk hunter. Todd has taken 28 bulls over the years with a pistol. An incredibly tough feat, that he has accomplished via mastering the art of tracking bulls down in the snow to a very close range. This podcast makes me wish I had an extra elk tag for the late season still. For those who are a bit timid about grizzly bears however you probably don’t want to listen to this episode because Todd also shares the vivid bone crushing story of getting attacked by a momma grizzly twice and surviving. This story was really good for me to hear as I sometimes become too complacent about being in bear country and this serves as a great reminder that bad thing do happen to even guys who are prepared and know what to do. Todays Wapiti Wednesday is brought to you by Phelps Game Calls. Phelps game calls are the best on the market in my opinion. This year I used the same reed all season, one reed for the whole month of September. I dare you to try that with any other diaphragm out there. Also, the new “un-RIVAL-ed Bugle Tube” Bugle tube is amazing. I am blown away out how much volume that miniature bat has for such a small size. Love how easy it is store and pack. It also doesn’t bang around nearly as much going through the brush. Also, I know most of you know Phelps calls as your go-to elk calling company but they also make some great predator and waterfowl calls as well. Just like their elk calls the quality and attention to detail is amazing. Check them out at PhelpsGameCalls.com and get free shipping on your order with code TRO.